Oftentimes, we get so busy caught up in the day-to-day operations of running a business that we postpone the operational decisions until we “have enough time” to deal with them. However, we put ourselves at risk every day when working online without the proper safeguards in place. It’s time to proactively protect your small business online. After all, nothing forces us to stop and take action quite like a cyber security issue. From a lost password, to a data breach, a security crisis can be stopped before it starts with a bit of planning and advanced preparation. You may be under the impression that your small business is safe online because of its size. We hate to be the bearer of bad news but unfortunately, size has nothing to do with it. Your company is always exposed to a certain degree of risk on the internet, and it’s up to you to safeguard your business as much as possible. In case you don’t know where to start that process, we’ve compiled a few ways for you to protect your small business in 2019. In the same way that you would never leave your doors unlocked overnight at home, you wouldn’t openly invite criminals to access your business information. However, by not locking your computers down, that’s exactly what you’re doing. One way criminals gain access to your information is through malware. Utilize a firewall – luckily, a good internet router will have an on-board firewall built in, so all you have to do is remember to turn it on! However, this is often not enough due to the complexity of malware, but it does provide a first line of defense. Protect home base – the best security software will go beyond standard protection and will reside on your computers without hindering the performance of the network. The protection you want will encompass identity theft, risky websites and hacker attacks all within one unified system. Lock down mobile users – good security systems will have location awareness to automatically change the security settings as employees move inside or outside the office. Clean up email – anti spam software reduces all unwanted emails, blocks risks and distractions for employees without needing to do so manually. Stop processing spam and save your employees valuable time by stopping it before it even reaches your business. Protect your business against malware with these 4 steps. Start out strong – require strong passwords, starting with a length of at least eight characters including embedded numbers so you can detect and stop attackers who simply guess passwords. Make frequent changes – time out old passwords and require employees to change passwords quarterly or monthly to stay ahead of lurking thieves. Keep passwords private – educate your employees about the risks of writing down passwords, storing passwords on cell phones, and using guessable choices. Employ help – for the strongest passwords possible, don’t use words or phrases at all. Instead, use a combination of random letters, numbers and special characters. If this sounds challenging, consider using secure password managers to encourage complex passwords so that your employees don’t have to remember them at all. Educate your employees about password security and use a password manager to encourage complex passwords. The amount of employees using their own devices for work in the small business market has risen significantly. This includes the increase in location-independent contractors in today’s gig economy. But what about the security risks associated with so many devices? To help minimize these risks, follow these steps to lock down all devices used for company business. 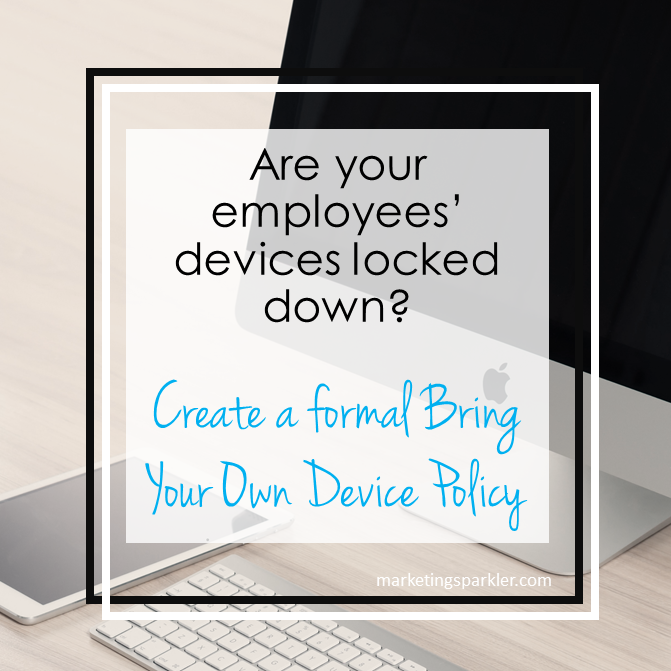 Formalize a ‘bring your own device’ (BYOD) policy – having a specific plan in place will provide a safety net against any potential legal repercussions you could face. Start by drafting a comprehensive, clear, and customized BYOD policy that includes details on data deletion, location tracking and internet monitoring. Utilize the cloud – take advantage of a cloud-based unified communications solution to seamlessly switch devices and maximize productivity. Even if your employees are on the go, they can utilize audio conferencing, web conferencing, virtual meetings, screen sharing and more from any device. The cloud gives your employees the freedom to access company information on their devices without the hassle of wires. Analyze the results – A lot of small businesses adopt the BYOD trend because of the increased productivity and overall competence associated with it. However, not all of those also take the time to gauge if the trend is worth the costs it accumulates. To make sure that BYOD is helping your company rather than hurting it, monitor your employees’ usage to help justify and determine if changes need to be made to your policy. Formalize a ‘bring your own device’ (BYOD) policy to protect your small business against cyber theft. Following these tips is a great starting point to protect your small business and keep its classified information safe in 2019. By foregoing many of these options, you could leave your company vulnerable to cyber theft and have to pay the consequences. Remember, no business is too small to get hacked. Help yourself combat the risks of cyber attackers and keep your business running smoothly. 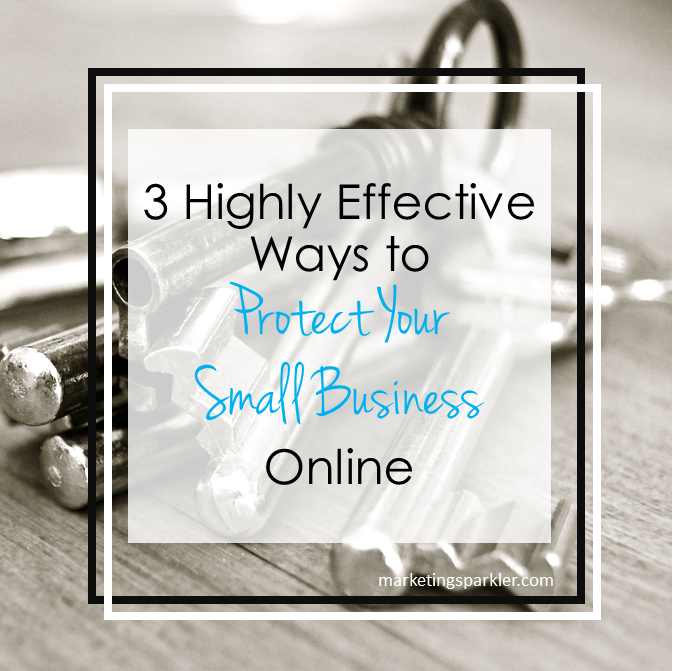 What’s your best tip for protecting your small business online?